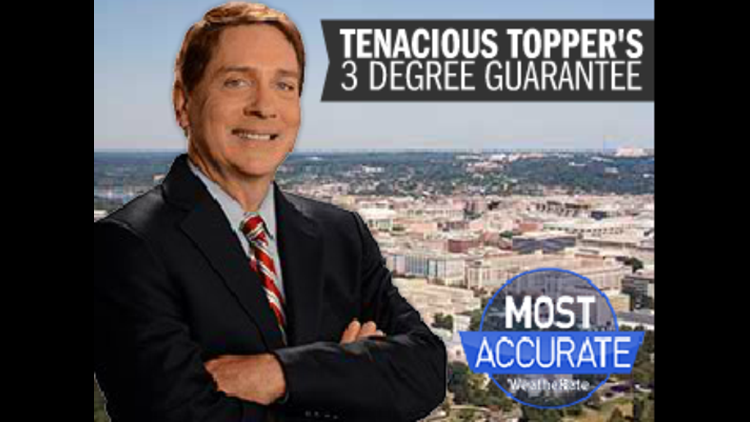 Every night at 11 PM on WUSA 9 news Tenacious Topper has the 3 Degreeº Guarantee. I am predicting a high temperature of 69° Thursday under mostly sunny skies. -----Topper Shutt is rated as the most accurate weather forecaster in Washington, D.C.
Don't believe the data? He's backing it up by providing a daily '3 Degree Guarantee' of the high temperatures at Reagan National Airport. Each day we'll post the new guarantee, and Topper will share the results each night on WUSA9 at 11. Follow @TenaciousTopper on Twitter, Facebook and Instagram for 'round the clock weather updates.